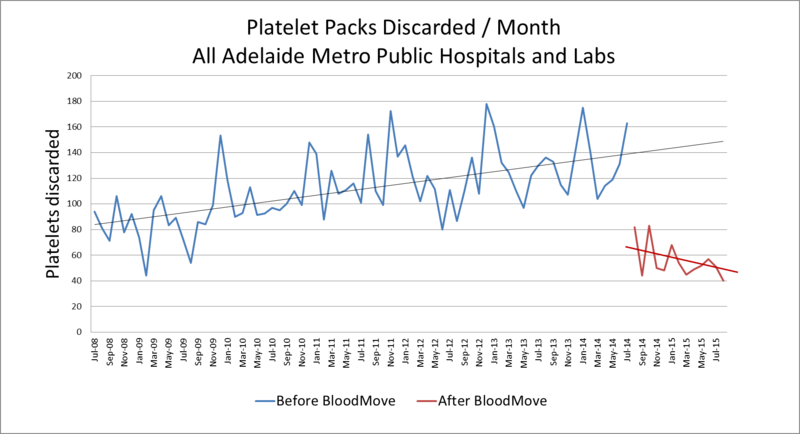 Within the first two months of operation, BloodMove Platelets achieved a significant decrease in the platelet wastage rate for metropolitan public hospitals from a previous high of 21.8% in July 2014 to 5.5% in September 2014. 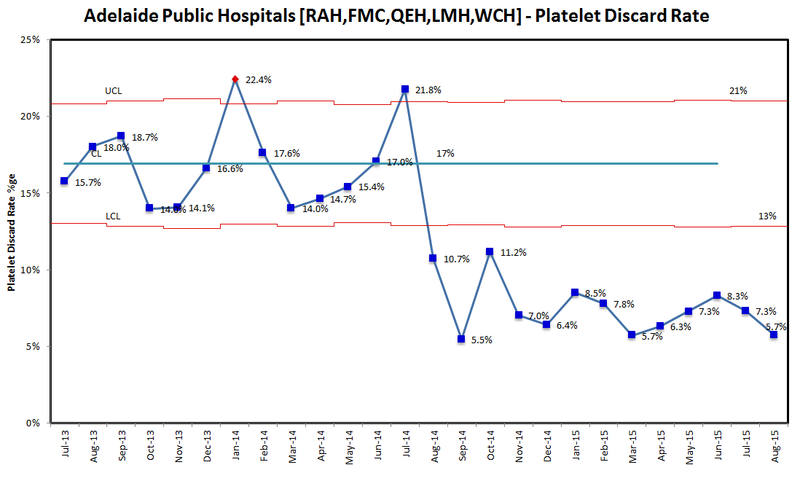 This decrease has been sustained for 12 months, with the average rate post-BloodMove of 7.8% including a number of months achieving rates below 6% (Figure 7). Compared to the 12 month pre-BloodMove average platelet wastage rate of 17%, this represents an approximate 54% reduction in the wastage rate. An annual cost saving of approximately $500,000 is being realised due to implementation of BloodMove Platelets. This is a conservative estimate as previously the wastage rate was trending upwards beyond 17%. Without the Program, wastage may have been greater. 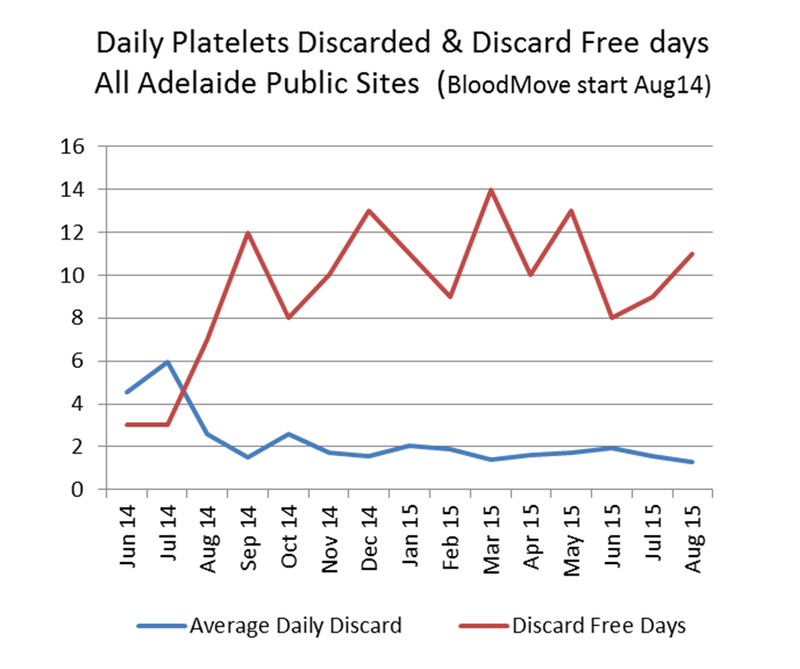 The absolute number of platelets discarded due to expiry by all metropolitan Adelaide hospitals was dramatically decreased by BloodMove as shown in Figure 8. The previous increasing trend of platelet wastage was not sustainable and necessitated implementation of BloodMove Platelets. The daily average of platelets discarded per month decreased from an approximate of 5 to a low of less than 2. The number of days per month without any discards also increased (from 3 to 8-14 days), making it more commonplace. Both improvements are shown in Figure 9. Wastage per day (Figure 10) was used as a Key Performance Indicator for staff and graphically showed high wastage days as peaks and zero wastage days as gaps. Platelet wastage figures were generally provided to staff in absolute numbers rather than as a percentage. Absolute numbers were considered a more reflective and real indicator of wastage and provided a tangible value to the product, whereas percentage was a calculated number which was dependent on other parameters such as platelet issue volumes.